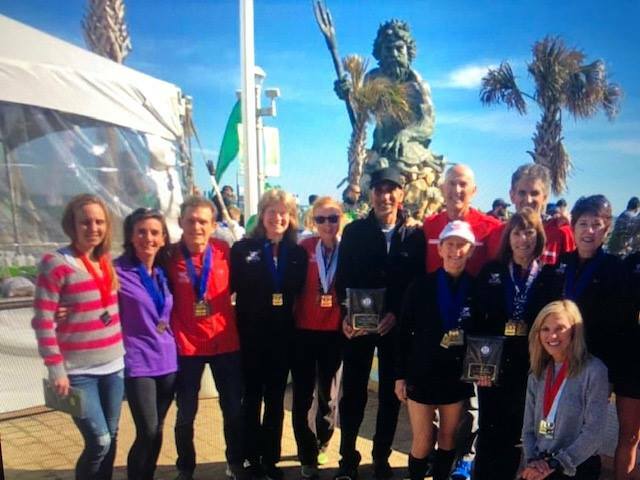 The winds, blowing at 13 mph, slowed up some of the fastest Masters Long Distance Runners in the country. Instead of having a couple of new US records, we came away with near misses. But there were still plenty of thrills along the way. With the first 2 miles run with the wind and the next 2.5 against the wind there were few negative splits. Who would walk away with the title of USA 8 Km Champion on the roads? For each Age Division, I look at the Women’s race first and then the Men’s. And then Men first for Teams. This division race was not close. Roberta Groner, the overall Champion, was running this race as one of her tune-ups for the Rotterdam Marathon, where she hopes to break 2:30. A 26:48 effort here blew away the chances that any rivals had for the Gold Medal. Knowing of Groner’s prowess, Impala teammates, Liz Gottlieb and Brooke Bray were more focused on their Atlanta rival, Jill Braley, who took 2nd at the XC Championships in Tallahassee 2 weeks earlier. Braley was not performing at the same level she exhibited in Tallahassee though. 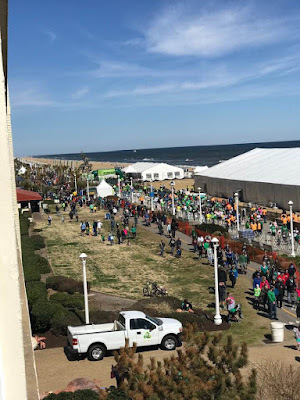 By the time they hit the 2 mile mark and swung over to the Boardwalk, Gottlieb already had over half a minute on Bray, with Braley gamely trying to stay close another 19 seconds back. This was the day of the Impalas though as Gottlieb stormed into the wind, building her lead. In the end she had the Silver Medal by over a minute on Bray, who enjoyed third place. Braley ended up in 4th place at 33:58. The race between David Angell, Mike Cole, and Paul Jones was covered in the Overall Race recap where they took 1-2-3. Although not as dominant as Groner, Angell enjoyed his largest margin of victory in the last three years. 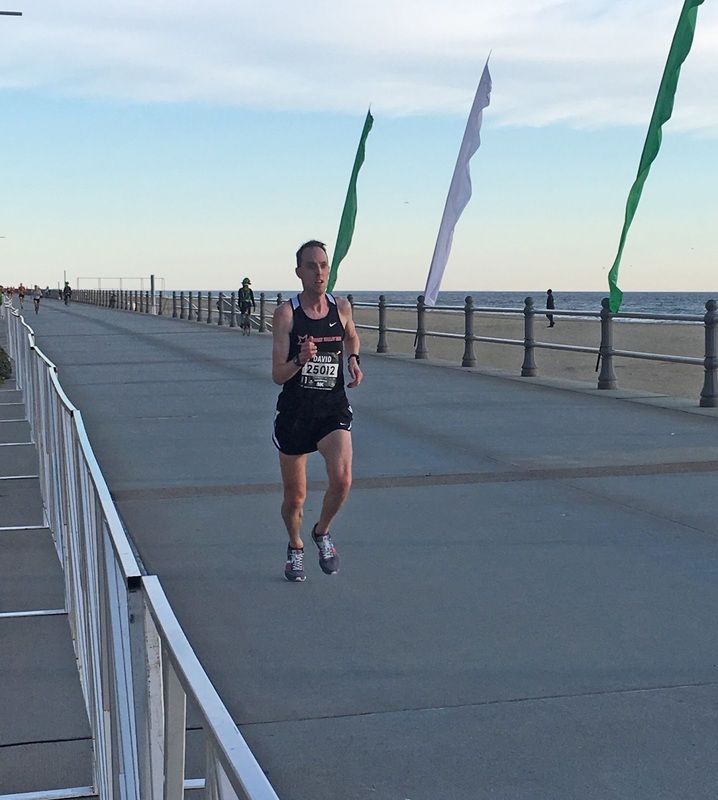 He is the sole Overall Men’s winner in the three years the Championship has been at Virginia Beach. Sam Teigen who took 2nd in the division to Angell last year was just a little off this year, running 40 seconds slower, and having to settle for 4th. Whether due to interrupted training due to injury or a clearer focus on an upcoming Marathon is hard to say. It was good to see Jake Stookey back on his game, cracking 27:00 to take 5th. In 2017 he ran a bit faster to take the Age Division Bronze medal but had an off day last year. Michelle Brangan was the defending Champion but she knew her effort last year of 32:30 was not what she was capable of. This year her training must have lined up better as she cut almost two minutes off her winning time from last year. And she needed a chunk of that as she was going up against Jennifer Malavolta, who took the Bronze Medal at the 15K Championships in Tulsa last October. By the 2 mile mark, it was clear that Brangan was gunning for an overall podium finish as she crossed the timing mat in 11:53 . Malavolta, at that point was over half a minute back and would likely not be competing at the same level she did at Tulsa. But with a half minute lead over Alexandra Newman, it did not look as if she would be pressed for 2nd. Newman, was in a tighter battle with Mia Von Peteghem for the final podium position; just 11 seconds separated them at the 2 mile mark. Brangan and Malavolta both built their margins over the 2.5 miles up into the wind. Try as she might, Newman could not really expand her lead, and the same goes for Van Peteghem who could probably see her F45 rival ahead but could not lose on her. The final margin was 12 seconds instead of 11 as both gave it their best shot! The Men's division was the closest race of the day and since the top finishers were also shooting for top overall finishes, it was covered in depth in the Overall Recap. Suffice to say that Brian Sydow and Jonathan Frieder had an epic battle where Sydow went out stronger, gaining a 5 second advantage by the 2 mile mark. But Frieder kept grinding and pulled him back by the 4 mile mark. Then it was a question of who had more left. Sydow had just a little more kick left as he pulled away in the final few hundred meters to take the Champion’s title in 26:26, with Frieder 4 seconds back! Greg Putnam, who has often battled with Frieder before, had to take it a little more conservatively this time, giving away 16 seconds in the first two miles. At the end he had another Age Division medal, taking the Bronze in 27:05, with a half minute on Derek Fenton in 4th. 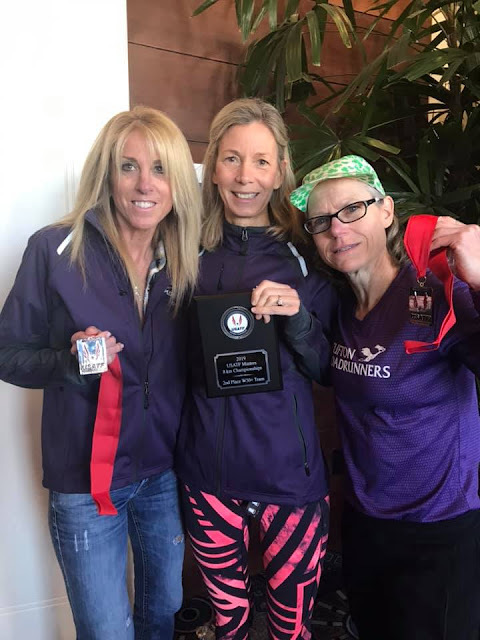 Two of the three who landed on the podium last year, Marisa Sutera Strange, and Suzanne La Burt, both aged up to 55-59. Michelle Simonaitis, who finished 2nd, did not make the trip this year. But Amy Fakterowitz and Mary Shah would give it their best shot in the race for 1st. Fakterowitz raced out to a 42 second lead by the 2 mile mark, with Shah crossing the mat at 13:12. Laurie Wharton and Laura DeLea were hot on her heels just 3 and 6 seconds back respectively. Fakterowitz pulled away up the Boardwalk, enjoying well over a minute margin in claiming the division Championship. Shah kept it going all the way to the finish, eventually pulling away for a margin of over a half minute on the two others. DeLea and Wharton battled all the way, but Wharton had a little more left in the tank as she eked out a 2 second victory to take the Bronze Medal. Last year Kent Lemme was primed and ready for a strong race. He took first in 26:43. That was only 25 seconds ahead of his teammate, Mark Hixson but it was two minutes ahead of the rest of the field. Lemme does not have the same focus this year; he is training with his daughter for Boston with the goal of their both breaking three hours. Still, Lemme, even if a bit off the top of his game, still entered as the favorite. 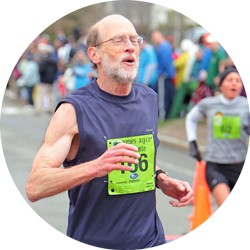 Others who would contend included a newcomer, Doug Mock, who has a 29:02 5 Miler to his credit from last October; Mike Nier, who missed last year's event but finished 6th the year before in 28:34; and Joe Shairs, who ran 35:51 at Dedham last year, to finish 6th in M45, age grade equivalent to a 28:33. Anyone who was counting on Lemme being so far off in his training for short events got a rude wake-up in the first two miles. Lemme did not cruise at the pace he ran last year, but he still hit the 2-mile timing mat in 10:44 with over a hundred meters on the field. The other three contenders were running in a tight pack, their eyes on each other to match any move or attack if there seemed to be any weakness. Lemme stormed up the Boardwalk and pulled away, adding another 14 seconds to his lead by the time he crossed the finish line in 27:42 for the repeat win! Mock and Nier were eventually able to drop Shairs, perhaps just before the final sprint down the Boardwalk to the finish. The race between Mock and Nier was not settled until the final hundred meters however, as Mock edged Nier for 2nd by 4 seconds! Wow! Some race! One would not normally expect that the Women's 55-59 race would already have been largely covered in the description of the Overall race but that was the case in this competition. Marisa Sutera Strange, took 2nd overall behind Roberta Groner, and took the division in 30:37. Suzanne La Burt, who just aged up to 55 this year, finished 4th overall in 31:43 and took 2nd in the age division. But there is still plenty to talk about. there was a heck of a race for the last remaining podium spot. 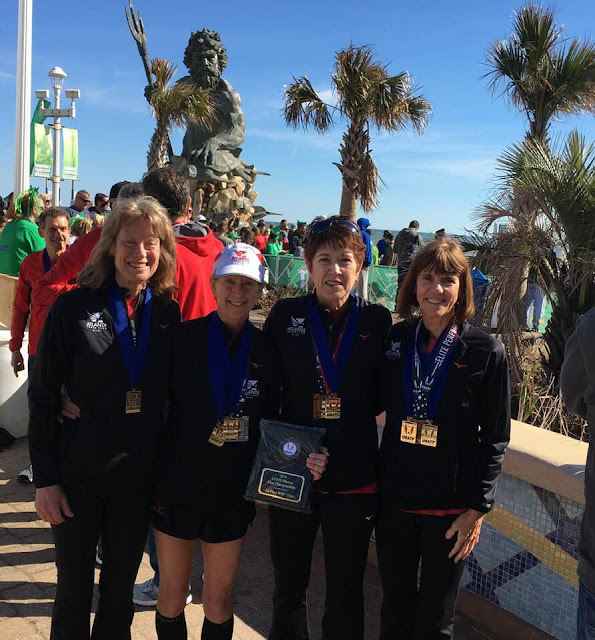 Kris Huff and her Atlanta teammate, Paula Johnson were new to the 8K Championship this year, but Karyl Sargent took 5th in the 50-54 division last year in 33:25. That might give her an edge. On the other hand, Huff and Johnson both clocked 21:23, gun time, in Atlanta for the 5K Championship. But the only time the three of them met in a Championship was the Masters 5 Km Championship in Buffalo. Sargent had the edge there, coming in a half minute ahead of Johnson and a full minue ahead of Huff. But that's Cross Country and Sargent perhaps had a bit of a 'home' town' advantage, at least in a regional sense, running for the Syracuse Track Club. Sargent took it out hardest, hitting the 2 mile timing mat in 13:30, but she had only 3 seconds on Huff and another two on Johnson; nothing was decided yet. They battled up the Boardwalk, swung around the turn onto the final 750 meters to the finish with a tailwind at their back. They were still close. Anyone could win it. Huff had the most on this day, taking the Bronze Medal in 34:10, with Johnson 4 seconds back, one second ahead of Sargent. Thrills on the final sprint down the Boardwalk for sure! Nat Larson, the Overall Age-Grading winner, had no problem winning the division, running only 5 seconds slower than his 2018 time, despite the wind! No one else in the division could stay within two minutes of Larson. Those competing for the rest of the podium included Gary Droze and Gary Leaman, along with Lester Dragstedt, should either of the Gary’s falter. Droze crossed the 2-mile mat in 11:29, the better part of a minute behind Larson. More importantly, though, he already had 8 seconds on Leaman. Eight seconds is not a lot though, especially as Leaman took 2nd to Larson last year, finishing a minute ahead of Droze. Dragstedt was 48 seconds back from Leaman and would likely have to settle for 4th. This was not Leaman’s day though. Try as he might, he could not close on Droze up the Boardwalk and Droze gradually pulled away, taking 2nd with a margin of the better part of a minute. Droze ran 41 seconds faster than he did in 2018. Leaman finished 3rd in 30:07, with over a minute to spare as Dragstedt took 4th in 31:09. John Van Kerkhove, who won here in 2017, took 5th place. The last two years, either the Impalas or the Red Lizards out of Northern California and Oregon respectively, took up the top spots in this division but neither team made the trip this year. 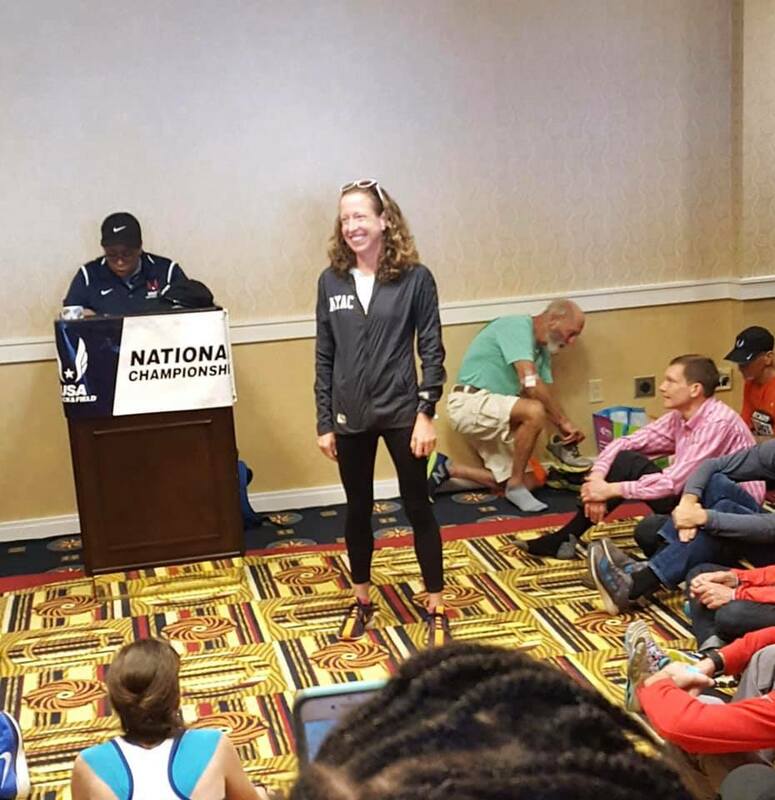 It might not have made much difference as Patrice Combs, who took the division title at last year’s Half Marathon and 5K Championships, entered as a strong favorite. That she took 4th place in age Grading overall, tells you that she did not disappoint. Neither the 2017 nor the 2018 winner was able to finish in less than 35 minutes but Combs did, hitting the 2 mile mat in 13:17, and finishing in 34:29, with over 4 minutes to spare on the field. That distance was irrelevant to the remaining competitors, however. Atlanta’s Cynthia Williams and Margaret Taylor would do battle again with their Genesee Valley rival, Sharon Moore. Last year Roger Sayre did battle with Joe Sheeran, the terrific XC runner, and Hall-of-Famer, Brian Pilcher, on the comeback trail. Sayre bested them both, not to mention Ken Youngers and came within 5 seconds of Norm Green's long-standing record. No Sheeran and no Pilcher this year. But Youngers was back, as was Norm Larson. They would try to make it closer than it was in Tallahassee, where Sayres beat them by half a minute, with Larson just 5 seconds back from Youngers. A teammate of Youngers, Jeffery Dundas, who bested Youngers in Tallahassee in 2018, would also challenge. Youngers must have felt good over the first wo miles. Even though Sayre hit the 2-mile mat 11:14, on pace to break the record by about 15 seconds, Youngers was only a couple of strides back in 11:16. Dundas must have been thinking, what is up with those guys as he came by in 11:29, on pace for a 28:30. Larson was having none of it as he came past the mat 19 seconds later. He probably saw Sayre and Youngers turn onto the boardwalk 150 yards ahead and then Dundas the better part of a hundred yards up Atlantic Avenue. Did he wonder if he'd see any of those guys again? Sayre battled his way into the headwinds on the Boardwalk, but lost too much time to challenge the record. He was able to drop Youngers though; Sayre built his winning margin to 43 seconds, crossing the finish line in 28:20. (His net time was 28:19, 7 seconds off the record.) Youngers, despite going out at sub-5:10 pace, had no trouble keeping the rest of the field at bay as he crossed the line second in 29:03. Somewhere in mile four, Larson must have noticed an M60 not quite so far ahead any more. He caught Dundas. 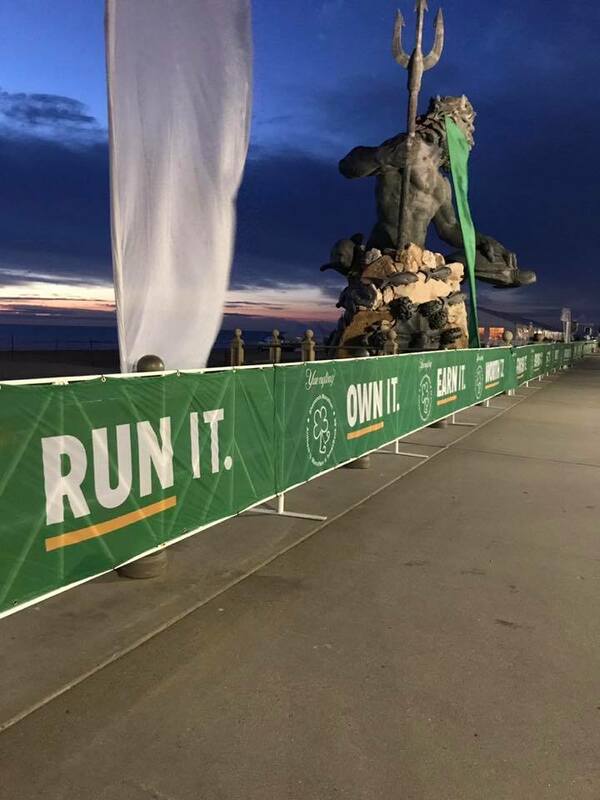 Whether he went past at speed after Mile 4 and then hung on to the gap he established, or waited until the final sprint down the Boardwalk to the finish things off, I do not know. But one way or another Larson found himself third M60 over the line, 7 seconds ahead of Dundas. Dundas was not too disappointed though, as he knew his presence made a big difference to his Atlanta team. Like the division above, this one has been dominated by runners from far off places. Edie Stevenson, from Colorado, won it in 2017 and then last year it went to Suzanne Ray, from Oregon. This year it would be a regional affair; the only competitor from outside Virginia, Kathleen Allen, came up from Georgia. Her primary purpose, as with many of the runners, was to be there for the team. She must have been surprised to find herself touted as the favorite for an individual National Championship. Patricia Travis and Martha Gullo were also there for a team. 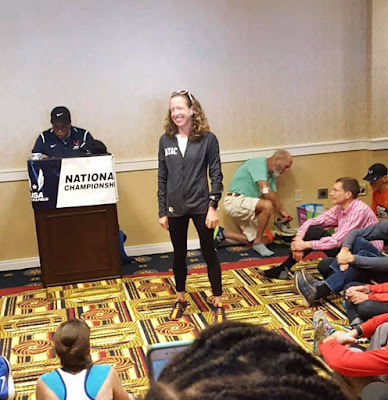 Kathleen Doswell, who ran in 2017 and finished just off the podium, probably just figured to give it another try to see if she could win a medal at a National Championship. The race unfolded as anticipated. Allen had no trouble establishing a lead as she crossed the timing mat in 17:14, a good 22 seconds ahead of Doswell. Travis came by about a minute later, with her teammate, Gullo, another minute back. All of those gaps got bigger as the race went on. Allen took the win in 43:15, her first national championship that I know of. Doswell earned her national medal by taking 2nd a couple of minutes later, followed by Travis in 47:07. Gullo took 4th. There was little doubt who would win this division. Tom Bernhard was going for his third straight win. In 2017, there actually was some doubt as Bernhard was coming back from injury, running 30:38 to take the title by only 19 seconds. The following year he ran 30:12, winning by 42 seconds. The only question was how fast Bernhard could go. If you read the earlier post, you know that his chip time of 29:47 was six seconds over the American Record. A little less wind and he might well have had a new record. In any case he took the title with over two minutes to spare. George Braun, Kirk Larson, and Joseph Reda were expected to contest for the other two podium spots. Reda got out the fastest, hitting the 2 mile mark in 12:57, Larson, who prides himself on starting conservatively, crossed the mat 10 seconds later. Braun was 15 seconds back. Perhaps this would not be his day; last year he ran 23 seconds faster than Larson. One might have thought Larson could close on Reda but Reda must have used similar tactics. The gap grew at about the same pace the rest of the way; Reda took 2nd with 29 seconds to spare. Larson was delighted to get his first podium finish at this 8K, taking 3rd in 32:33, with Braun a half minute further back in 4th. Suzanne Gibson, Barbara Biasi, and Judith Robertson finished 1-2-4 last year. Would it be different this year? They had one additional competitor, Barbara LoPiccolo. The only information I could find about LoPIccolo was that she had been one of the first women to compete in intercollegiate athletics, becoming a College Hall of Famer in the process. She also had some impressive results in Throws in Track and Field competition. But nothing on the track or roads. There are sometimes athletes in other disciplines who turn to running after retirement and learn they are quite good at it. Thinking this might be the case, I mentioned her prominently as a potential favorite. As it turned out, I was very wrong! Gibson knew what she had to do to run as well as last year when her 46:38 was the winning time. She led out strongly hitting the 2 -mile mat in 18:18 with more than a minute back to Biasi in 2nd. A couple of minutes later, Roberstson came across in third. LoPiccolo came 4th, some distance back. There was a Matthew LoPiccolo who finished 4th in Men's 40-45. Perhaps he encouraged his Mom to run just for fun? And perhaps she enjoyed it that way. Gibson had no problem the rest of the way; the finishing order was the same as last year except that Robertson took 3rd, not 4th. Jim May, Paul Carlin, and Gene French went 1-2-3 in 2017. Last year it was Dave Glass, Tony Gingello, and Jim May, with Ezequiel Garcia, running unattached in 5th. None were mentioned this year as favorites for the podium, but never count May out. And this year Garcia was running for a team; would that improve his prep or incentives for the race? The favorites were Lloyd Hansen, Jerry Learned, and Terry McCluskey. At the 5K Championships in Atlanta, it was Hansen-Learned-McCluskey-Glass taking 2nd through 5th behind Gene Dykes. Hansen and Learned were 1-2 at the 15K, although separated by a few minutes. The results in XC were a bit different though. McCluskey finished ahead of Hansen at both the 5 Km XC, by a minute, and at Club XC in Spokane, over 8 Km, with a margin of 40 seconds. Learned was typically trailing Hansen, sometimes pretty close, sometimes further back. Gingello was not running. Carlin, French and Glass were running, but not as effectively as in prior years. Hansen left no doubt about the outcome as he sped to a 42 second lead at the 2 mile mark. Garcia and Learned crossed the 2-mile mat with the same time of 13:40, neck and neck. May and McCluskey came next with only a second between them. This would not be one of McCluskey's days at the front. Fourteen seconds later, Glass crossed the mat, with May's teammate, Doc Rappole, only two seconds back. Learned and Garcia battled up the Boardwalk as Hansen was pulling away. In the end he had the victory in 32:36, enjoying a winning margin of well over two minutes. Neither Garcia nor Learned could gain an inch on the other, and no one was catching them from behind. In the end, Learned had just enough to get the 2nd place in a photo finish. According to the timing devices, Learned's margin was 0.03 seconds. The Referee determined, from the photo finish, that Learned had the edge! What a contest? Wow! Learned is tough to beat heading down the stretch, so Garcia must also be pretty fierce leaning into the finish! Heading north up the Boardwalk, May pulled away from the rest of the field and took 4th a half minute back from the dueling duo. In 2017, Madeline Bost had to be satisfied with a Bronze Medal. But last year she took the Gold unopposed and would also this time. That's another hundred points towards her campaign for a 6th consecutive Masters Grand Prix title. Last year was the first year this Championship saw a competitor in the Women's 80 and over division. Libby James made the trip from Colorado, inspiring many with her American Record performance of 42:51. This year Tami Graf was the lone entrant. Graf currently holds the Mile Record of 11:29. But she also won titles at the 5Km on the roads in Atlanta and at the 5 Km XC in Buffalo. She took the title here in 1:04:40, her first hundred points toward retaining the Masters Grand Prix title she earned this past year. This was the first year John Elliott contested this Championship but, like so many others, he went home with Gold, although unopposed this time. He took the 5 Km XC title last year and the Club XC title in 2016. For the first time, this Championship saw a competitor in the 90 and up division. Richard Soller took the 5 Km title on the roads in Atlanta last August and took the title here. Perhaps he will go for a repeat win in Atlanta? We shall see. Last year the Garden State Track Club took the title with 3 minutes to spare over the Roanoke Valley Elite. Sam Teigen, Jonathan Frieder, and Gary Leaman keyed them to the title while David Angell, James Holbrook, and Paul Lenkowski led the way for Roanoke. All three were back for Garden State but Holbrook could not make it and Lenkowski was a late scratch for Roanoke. The Willow Street AC finished 5th last year with Volker Burkowski, Derrick Staley, and Jake Stookey, returning from injury, doing the honors. With Stookey back running almost as well as ever, they could expect to lower their time by 2-3 minutes and be in contention. The Colonial Road Runners, who finished 4th last year behind Mark Tompkins, Keith Schumann, and Jason Miller. This year they added Victor Fleming and Donald Lynn to see if they might not be able to bring home a team plaque this year. Despite Teigen being slightly off his game this year and Leaman struggling a bit, Garden State established a one minute team lead in the first two miles. After Angell took the first team spot with 10:02, Frieder and Teigen came next with 10:18 and 10:31. 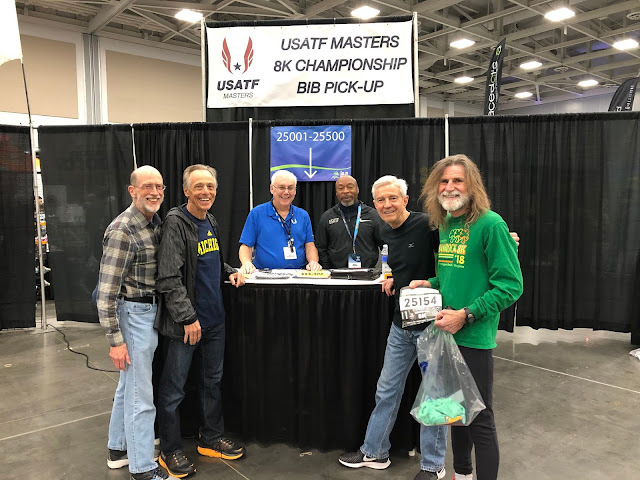 They did not know if Leaman, who crossed the mat in 11:37, or their two other teammates, John Hogan and Harold Patch, who were two seconds ahead, would be their third scoring runner. Having that extra insurance was comforting. Their first three added up to 32:26. The next three were tightly bunched. Second, with Angell leading the way, was Roanoke, but only by 4 seconds. With Colin Munsey at 11:11 and Matthew Wright at 12:11, they had 33:24. Colonial was led by Fleming in 10:32, with Schumann at 10:50 and Lyn and Lockard knotted at 12:06 for 33:28. And Willow St. was only another 6 seconds back with Stookey leading the way in 10:44, Burkowski at 11:10 and Andrew Reed at 11:40 for 33:34. Willow St. could be dangerous because Stookey is known for moving up during his races. Garden State looked good for the repeat win as Frieder and Teigen totaled 53:15 for the first two scores, while Roanoke was at 55:08 from Angell and Munsey, 23 seconds ahead of Colonial's leading duo, Fleming and Schumann in 55:31, and another 16 ahead of Willow Street, with Stookey and Burkowski accounting for 55:47. Garden State's Hogan came in before all of the #3 runners on other teams and that sealed the deal for Garden State, at 1:22:21 (average of 27:27). There was enough time disparity between the #3 runners that the final order changed. Willow Street's Andrew Reed came home 47 seconds ahead of Colonial's Lynn, giving them the 2nd place prize in 1:25:52. But Lynn came in just enough ahead of Roanoke's Wright, as it turned out, to give Colonial the 3rd place finish by a single second, 1:26:23 to 1:26:24. Last year the Genesee Valley Harriers, the Colonial Road Runners and the Shore AC took 1-2-3. This year GVH did not bring a team in this division, but the Impala Racing team from the S.F. Bay area came as did the Atlanta Track Club. Colonial and Shore were back to see if they could move up the ladder and finish a bit higher this year. The Impalas were locked in on first, however as their top 3 runners, Liz Gottlieb, Brooke Bray, and Alexandra Newman, all crossed the 2-mile mat 16 or ore seconds ahead of the top runner for the other teams. Their two-mile score was 38:15. They led wire to wire, capturing 1st place in 1:38:26, an average of 32:49. Atlanta seemed headed for 2nd as their top 2 runners, Jill Braley and Paula Johnson, followed the 3 Impalas across the 2 mile mat. Their 33, Maureen Martin was only a minute back from Johnson, giving them 1:29 and a solid lead over Colonial, whose first three, Kafrla Havens, Kimbery Votava, and Susan Hagel totaled 44:15. Colonial, in turn, had over a minute on Shore. Christine Hill, Nacia McQueen and Susan Stirrat had a time of 45:21 at that point. All the gaps grew bigger over the course of the race and there were no surprises. Atlanta took 2nd, nearly 8 minutes behind the Impalas in 1:46:16. Colonial was over 6 minutes back in 3rd with a two minute margin on Shore. 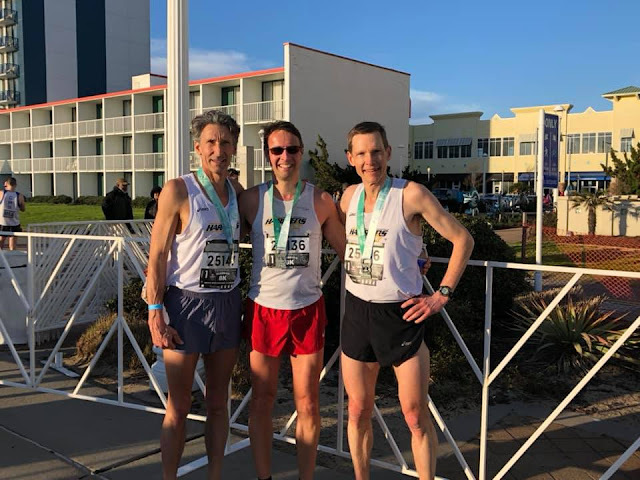 Last year the Greater Springfield Harriers enjoyed an 11 minute victory--hardly surprising when Kent Lemme, Nat Larson, and Mark Hixson all either broke 27 minutes or came within a few ticks of it. The Colonial Road Runners were able to edge the Genesee Valley Harriers for 2nd. They substituted Francis Burdett for Hixson, not much loss there, unless Burdett was still suffering from injury aggravated in Spokane. Lemme would likely not be as sharp because his main emphasis this spring is on training with his daughter for Boston; the aim is for them both to break 3 hours. 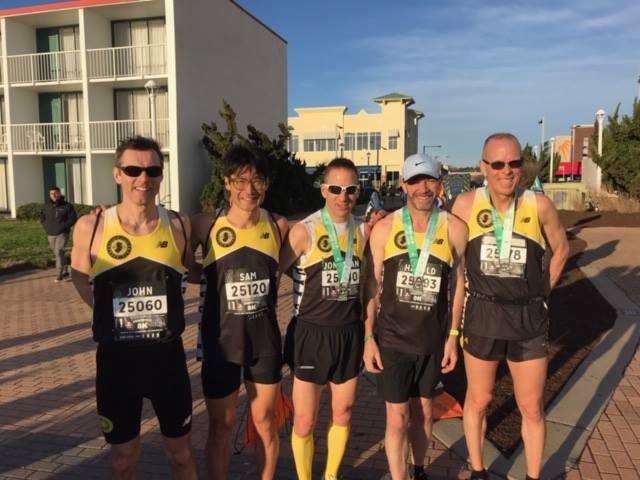 Last year the Shore AC was just running for Masters Grand Prix points with two 70+ runners as two of the three scoring runners; they finished 4th and were happy to add the 70 points toward their GP total. 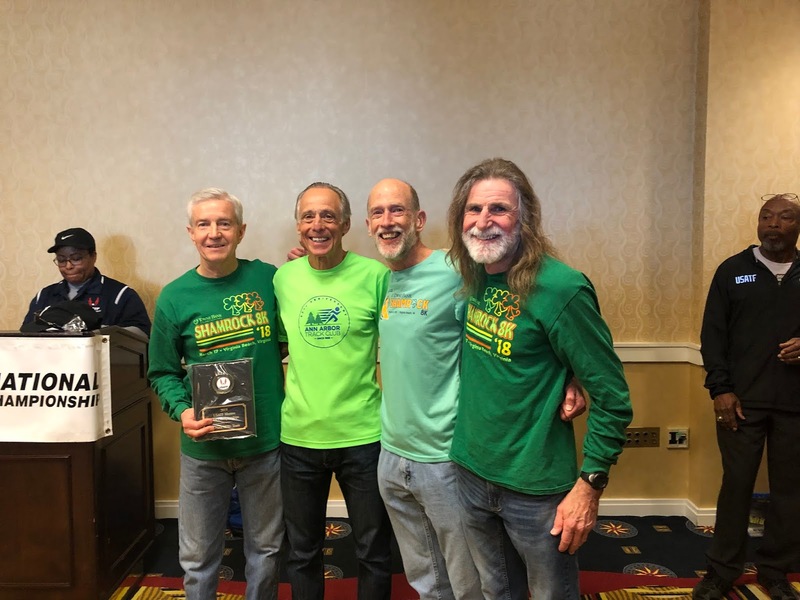 This year they were coming with three runners in their 50's, in addition to two 70+ runners, Przemek Nowicki and Roger Price. Last year Brian Hill was #1 for Shore; this year he expected to be #3 behind Jeff Conston and Ken Ginsburg. The Colonials and GVH were back along with a new entrant, the Atlanta Track Club. It is true that the GSH team was not as strong this year, but they were plenty strong enough. At the 2-mile mat, Larson, Lemme, and Burdett totaled 31:51. No other team cracked the 35 minute barrier. It appeared Shore and Atlanta would fight over 2nd and 3rd. Atlanta's Gary Droze crossed the 2-mile mat in 11:29, ten seconds ahead of Shore's Ginsburg. Brad Slavens, Atlanta's #2 had 5 seconds on his Shore counterpart, Jeff Conston. Lester Dragstedt, Atlanta's #3 had two seconds on Shore's #3, Brian Hill. None of those margins are insurmountable and the latter two, in particular, could easily be reversed over the remainder of the race. At that point Atlanta had a 17 second lead, 35:25 to 37:42. It was the better part of two minutes back to the other two teams in the field, GVH and Shore, engaged in their own tight duel for 4th and 5th. Mike Nier gave GVH a big initial edge over Colonial as he came across the timing mat in 11:11. But once Colonial's Michael Hulett crossed in 12:14, he was followed quickly by Paul Pelletier 6 seconds later, and then 11 seconds later by his teammate, Greg Dawson. That tight pack gave this early edge to Colonial as GVH's #'2 and 3, John Van Kerkhove and Wayne Crandall, were 20 and 37 seconds behind Dawson. Colonial had a 5 second edge at that point, 37:05 to 37:10. Greater Springfield brought it home with a 1:24:15 (average 28:05), good for a 6 minute margin on the field. Second place was decided by a narrow margin. Try as he might, Droze could not build on his lead over Ginsburg, and try as he meet, Ginsburg could not close on Droze. In the end they were still separated by 19 seconds. Shore's Conston was able to pass Slavens and put a 26 second gap on him. That turned out to be enough. Dragstedt came in three seconds ahead of Hill but that was not enough to keep Shore from taking 2nd in 1:30:22 with a 4 second margin. Atlanta took 3rd. There was a reversal in the battle for 4th place as well, with Nier expanding the gap he had on Colonial's #1 to the better part of three minutes. With that big a gap, Nier's teammates, Van Kerkhove and Crandall just had to stay close to their counterparts, and they did. Van Kerkhove was less than a minute behind Hulett and Crandall was a little over 30 seconds behind Dawson. That flipped 4th place to GVH, 1:34:07 to 1:34:25. Another fine victory for Greater Springfield and a great duel for 2nd between Shore and Atlanta made for an exciting division contest. Things were popping on the Women's side too with a tight battle for 1st between the Atlanta Track Club and the Clifton Road Runners and a duel between GVH and the Impala Racing team for the final podium spot. Last year it was similar except that an Athena Track Club team dominated with Clifton a solid 2nd. But, like this year, GVH and Impala had a tight contest for the third place position. Clifton would rely on Suzanne La Burt to give them an intial edge and then it would be Laura DeLea's and Kerry Monahan's job to stay as tight to Atlanta's #2 and 3 as they could. La Burt did not disappoint, giving Clifton a 53 second lead at the 2-mile mark. And 3 seconds after Shah came across the mat in 13:12, her teammate, Laurie Wharton did so, with a 3 second gap back to Clifton's DeLea. Atlanta's #3 at that point, Kris Huff, had enough of a lead over Clifton's Kerry Monahan, to leave Atlanta with a 4 second lead at the 2 mile mark, 39:57 to 40:01. In the race for 3rd, the Impala's #1, Janet Smith hit the 2 mile point 15 seconds ahead of GVH's Sandra Gregoritch. But when GVH's Colleen Magnussen came across the timing mat 16 seconds ahead of the Impala's Teresa Quan the 2 teams were essentially even. GVH's Sharon Moore, dropping down from her usual 60+ team, had enough of an edge on the Impala #3, Mary Bryan, to give GVH a 54 second lead. By the end of the race, La Burt built her edge to over two minutes but, try as she might, Clifton's DeLea could not shake Huff and Wharton. DeLea ran a minute faster last year but her prep this year was interrupted by a back procedure 4 weeks earlier. But when Huff and Wharton came across the finish line in 34:10 and 34:16, two seconds ahead of DeLea, that gave Atlanta the win! Clifton's Monahan came in ahead of all runners on other teams except the Impala's Smith. So Atlanta had the win in 1:42:07, followed by Clifton in 2nd with a time 48 seconds higher. As far as 3rd place goes, all of the gaps to bigger but the order did not change. GVH took 3rd with a gap to the Impala's time of 1:04. Last year the Atlanta Track Club enjoyed a hard-earned 56-second victory over the Boulder Road Runners, and only 17 seconds separated Boulder from the Cal Coast Track Club in 3rd and it was only 19 more seconds back to the Shore AC in 4th. All of those teams were back with the exception of Cal Coast. GVH and Colonial who finished 7th and 9th were back as well to see if they could manage a better showing. Some of Boulder's stronger runners could not make it so those who did knew they would need a good day to compete with Atlanta. Atlanta was in 'taking no prisoners' mode. At the two mile mark, Atlanta's Ken Youngers, Jeffery Dundas, and Mike Anderson came across 2-3-5 for a time of 34:54. And they had Phil Richey and Kirk Lartson both coming across under 13:00 so no real fall-off even if one of the first three should falter. Roger Sayre led everyone at 11:14, but Boulder's total at that point once Nate Anderson and George Braun had also crossed the 2-mile mat, 37:01. Two minutes is a lot of time to make up. Shore had a tight pack but lacked the up front star-power of Boulder and Atlanta. 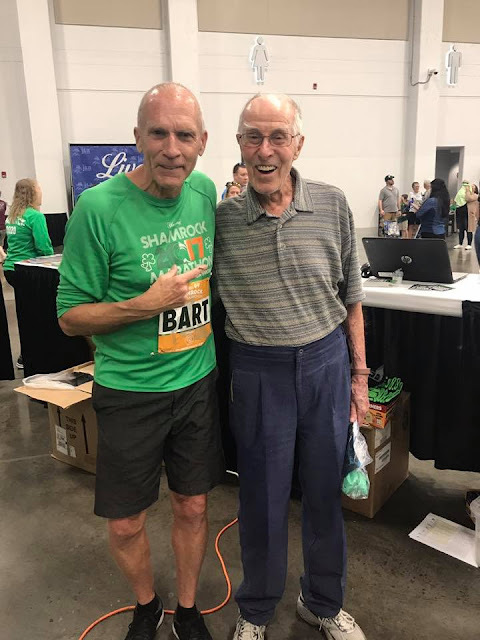 With Reno Stirrat, leading the way, despite the fact that he would be aging up to 65-69 before the next Championship, and Michael Mooney and Kevin Dollard providing strong support, totaled 37:49. In addition to Tim Riccardi, who came across 4th in 12:07, GVH had Kevin Clinefelter and Mitch Moore contributing for a 39:17. It looked like an Atlanta-Boulder-Shore-GVH finish although if Shore had a strong last 3 miles in them, the 2nd and 3rd place outcome was no sure thing. 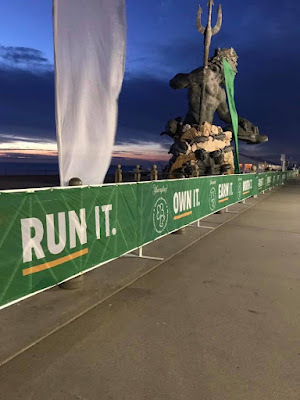 As it turned out, though, everyone ran strong over the latter part of the race course and in the end Atlanta clocked 1:29:55 (29:59 average), with 4 minutes on Boulder. Boulder was able to keep Shore at bay, taking 2nd by 45 seconds. GVH was on the outside of the podium looking in, but happy to have the 70 Masters Grand Prix points that go with their 4th place finish. Last year, Team Red Lizard from Oregon and the Impala Racing team from the S.F. Bay Area took 1-2 and the Atlanta Track Club had to settle for third. With those two teams staying home this year, Atlanta looked to make it a sweep of the 60+ races men's and women's. The Colonial Road Runners needed one more 70 year old to field a Women's team. 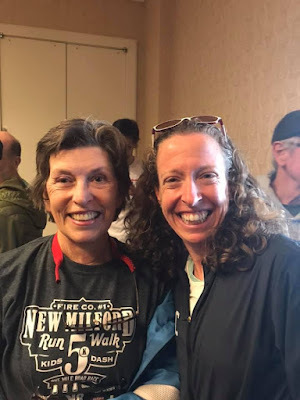 As they did not find anyone who was ready to run, Suzanne Gibson and Barbara Biasi ran on he 60+ team, serving as #1 and #3. They were no match for Atlanta but were happy to go home from a National Championship with the 2nd place Team Plaque. Patrice Combs, Cynthia Williams, Margaret Taylor, and Kathleen Allen of Atlanta all came across the timing mat at 2 miles well ahead of their Colonial rivals. And it continued that way over the final 3 miles, with Combs, Williams and Taylor combining for a 1:54:08 (38:03 average). Allen provided strong support should it have been needed, finishing in front of all of the Colonial team. 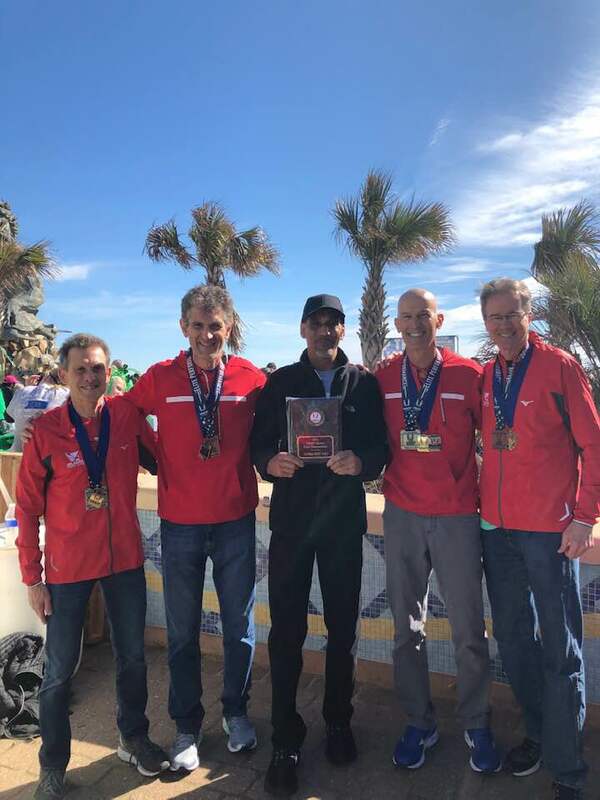 Colonial proudly took home the team plaque, emblematic of a Runner-Up finish at the 2019 National Masters 8 Km Championship. Last year Tony Gingello led GVH to victory. With strong support from Jim May and Keithe Yeates, they had a 4 minute margin over the Boulder Road Runners, the 2nd place team. Gingello is out injured this year but May and Yeates are back, along with Doc Rappole, who aged up in January. In 2015, when Rappole was at the top of his game, he won the 65-69 division at the USATF XC CHampionships in Boulder. 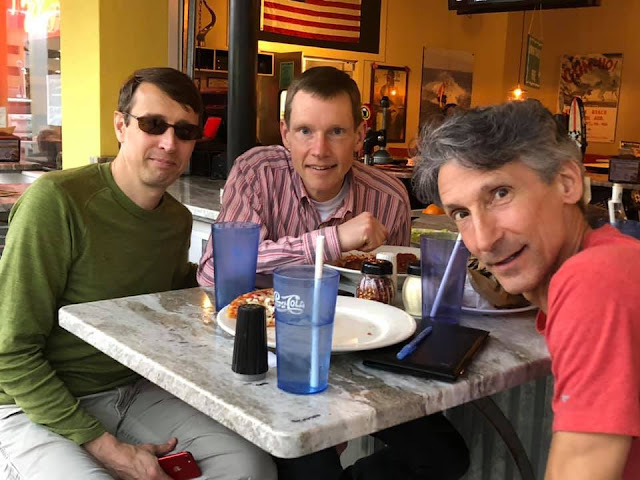 Boulder did not field a team this year, but the Ann Arbor Track Club and the Atlanta Track Club who finished 3rd and 4th, were back with improved teams due to key runners aging up and/or getting out of rehab and back t fitness. Lloyd Hansen and Terry McCluskey both turned 70 last year and gave Ann Arbor a strong 1-2 punch at the 5K and the two XC races last year. Hall of Famer, Doug Goodhue, 76, eased his way out of rehabilitation and amazed everyone by returning to the top of his game, as if he had never left. He had been a strong #3 or, if one of the first two did not run, a strong #2 since last summer. Paul Carlin, [that's me] who was running #1 last year at this time, has struggled to regain his form, but provides strong insurance if needed. Atlanta got help too in the form of Jerry Learned who continues at the same high level he established after going through a rough patch form 2014 to 2016. He and Dave Glass, who won the division last year, give Atlanta a strong 1-2 punch. Glass, like Carlin, though, has struggled lately to re-establish his form. Despite McCluskey having an off day, Ann Arbor left little doubt that they would take the victory. Hansen, Goodhue and McCluskey combined for a 40:26 and over a 2 minute margin on GVH. It was closer between GVH and Atlanta. Learned went across the timing mat in 13:40, giving them a 19 second bulge as GVH's May crossed in 13:59. That was not enough though as GVH's #2 an 3 gave strong enough support to give GVH a total time of 42:57 at the 2-mile mark compared to the 44:07 that Learned, Glass, and Sam Benedict clocked. The Clifton Road Runners, led by Ezequiel Garcia, who was running neck and neck with Learned, nonetheless found themselves over 4 minutes back from Atlanta in 4th. Ann Arbor carried the day with a 1:43:16 (34:25 average) for a 6 minute edge over the 2nd place team. In 2017, the Colonial Road Runners took this division unopposed. As noted above, Suzanne Gibson and Barbara Biasi could not find a 3rd 70+ team member ready to run this year, so they raced with the 60+ team. No other clubs fielded a complete team either. These Championships were characterized by strong running, whether in making an attempt at a record, acquiring the title of Individual National Champion or Podium Finisher or running for one's team. Many combine those goals but all run fast for at least one of them. On to Dedham, Massachusetts next and the Masters 10K [road] Championship. This has been one of our most popular and most competitive races in recent years.